Evil begets evil on the sabbath of the undead! 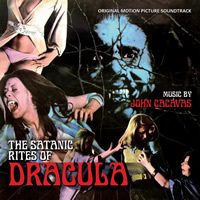 BUYSOUNDTRAX Records, in association with GDI Records, presents the original soundtrack to THE SATANIC RITES OF DRACULA. The soundtrack features music composed by John Cacavas for the 1973 Hammer horror film directed by Alan Gibson, written by Don Houghton, starring Christopher Lee in his final appearance as Count Dracula in the Hammer Dracula series, along with Peter Cushing, Michael Coles, William Franklyn, Freddie Jones, Joanna Lumley, Richard Vernon and Barbara Yu Ling. When it came time to score THE SATANIC RITES OF DRACULA, Hammer producers turned to composer John Cacavas, who had impressed them with his recent score to HORROR EXPRESS, starring their friends Christopher Lee and Peter Cushing. Cacavas would provide the film with music that was similarly contemporary but also more mature. In his approach to scoring the film, Cacavas uses modern jazz/pop sensibilities to score the villains of the piece, saving the traditional orchestral writing for Van Helsing and his associates. Dracula and his servants are represented in the score by modern electronic musical elements. John Cacavas began his musical career at age 13, forming his own band in Aberdeen, South Dakota. He went to college at Northern State University and then went on to study music and composition at Northwestern University in Evanston, Illinios, where he became active as an arranger for several varsity musicals and director of a weekly radio orchestra broadcast. Upon graduation, he entered the Armed Forces and became an arranger with the prestigious United States Army Band in Washington, D. C. It was there that he began writing arrangements and compositions for the nation's major music publishers. Upon his discharge, Cacavas moved to New York and began pursuing his career in earnest, continuing his composing and arranging. He served as assistant conductor at CBS under the tutelage of the esteemed Alfredo Antonini, and worked closely with Morton Gould. Cacavas went on to become Director of Publications at Chappell & Co. Inc. while continuing with his composing career. In 1970, he and his family moved to London where he became established as a film composer. Three years later he relocated his family to Beverly Hills where he became a full-time composer for feature films and television. Cacavas has written extensively for television. Along with his five years of scoring KOJAK, and three years of HAWAII FIVE-0, he has written for such diverse shows as MATLOCK, COLUMBO, QUINCY, MURDER SHE WROTE, THE EQUALIZER and BIONIC WOMAN, among others. His music has also appeared on FRIENDS, EVERYBODY LOVES RAYMOND, MALCOLM IN THE MIDDLE, MAGNUM P. I., DAWSON’S CREEK, BUFFY THE VAMPIRE SLAYER, X-FILES and countless others. A sample of his scores for TV movies are TIME MACHINE, MURDER BY REASON OF INSANITY, POLICE STORY II, DIRTY DOZEN II and III and THE RETURN OF IRONSIDE. His scores for mini-series include THE EXECUTIONER’S SONG, JENNY’S WAR, CONFESSIONAL, A DEATH IN CALIFORNIA and PERFECT MURDER, PERFECT TOWN. Feature motion picture credits include AIRPORT '75 and AIRPORT '77, PLAYING WITH FIRE, HANGAR 18, REDNECK, PANCHO VILLA and source music for KING OF COMEDY. BUYSOUNDTRAX Records presents the original motion picture soundtrack to THE SATANIC RITES OF DRACULA in film order. The booklet contains exclusive liner notes written by noted author Randall D. Larson, featuring comments from the composer. THE SATANIC RITES OF DRACULA is presented by BUYSOUNDTRAX Records and GDI Records, continuing in the fine tradition of GDI’s incredible series of soundtracks from the Hammer vaults.